Twenty-five separate articles of agreement were passed as part of the 1707 Treaty of Union, fifteen of which dealt with economic matters. Articles 16 and 17 had an immediate impact on the day-to-day lives of ordinary Scots as they standardised how goods were to be weighed, measured and paid for. 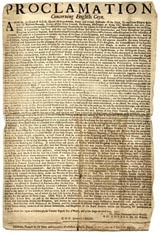 English forms of currency, weights and measures were adopted and public notices concerning the new procedures were issued from Edinburgh, such as this rare proclamation concerning the adoption in Scotland of English silver-money. Coins were still minted in Edinburgh, indicated by the letter 'E' below Anne's bust on coins, but this practice continued for only two more years despite the provision in Article 16 that a mint would be maintained in Scotland. 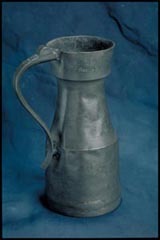 This lidless pewter pot, or 'tappit hen', resembles the measures used by members of the Hanseatic League, an alliance of trading guilds which had a virtual trading monopoly in the Baltic and North Sea region from the fourteenth to the seventeenth centuries. It probably pre-dates the 1707 Union as it bears the inscription '1/2 GALLn', or two Scottish pints, which was the equivalent of six English pints.